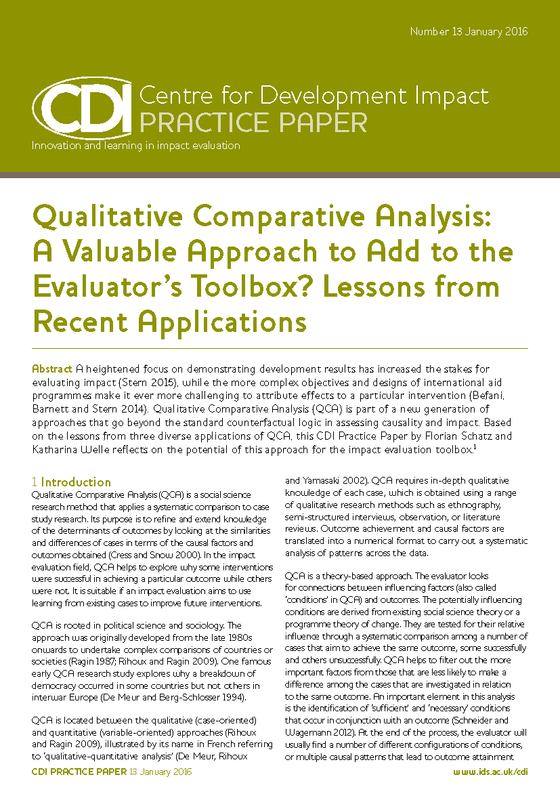 Qualitative Comparative Analysis (QCA) is a means of analysing the causal contribution of different conditions (e.g. aspects of an intervention and the wider context) to an outcome of interest. QCA starts with the documentation of the different configurations of conditions associated with each case of an observed outcome. These are then subject to a minimisation procedure that identifies the simplest set of conditions that can account all the observed outcomes, as well as their absence. A combination of Condition A and condition B or a combination of condition C and condition D will lead to outcome E.
Configurations of causal conditions, not just single causes. In the example above, there are two different causal configurations, each made up of two conditions. Asymmetric causes – where the causes of failure may not simply be the absence of the cause of success. In the example above, the configuration associated with the absence of E might have been one like this: A*B*X + C*D*X →e Here X condition was a sufficient and necessary blocking condition. The relative influence of different individual conditions and causal configurations in a set of cases being examined. In the example above, the first configuration may have been associated with 10 cases where the outcome was E, whereas the second might have been associated with only 5 cases. Configurations can be evaluated in terms of coverage (the percentage of cases they explain) and consistency (the extent to which a configuration is always associated with a given outcome). QCA is able to use relatively small and simple data sets. There is no requirement to have enough cases to achieve statistical significance, although ideally there should be enough cases to potentially exhibit all the possible configurations. The latter depends on the numbers of conditions present. In a recent survey of QCA uses the median number of cases was 22 and the median number of conditions was 6. For each case the presence or absence of a condition is recorded using nominal data i.e. a 1 or 0. More sophisticated forms of QCA allow the use of “fuzzy sets” i.e. where a condition may be partly present or partly absent, represented by value of 0.8 or 0.2 for example. Or there may be more than one kind of presence, represented by values of 0,1,2 or more for example. Data for a QCA analysis is collated in a simple matrix form, where rows = cases and columns = conditions, with the rightmost column listing the associated outcome for each case, also described in binary form. QCA is a theory driven approach, in that the choice of conditions being examined needs to be driven by a prior theory about what matters. The list of conditions may also be revised in the light of the results of the QCA analysis, if some configurations are still shown as being associated with a mixture of outcomes. The coding of the presence/absence of a condition also requires an explicit view of that condition and when and where it can be considered present. Dichotomisation of quantitative measures about the incidence of a condition also needs to be carried out with an explicit rationale, and not on an arbitrary basis. For a worked example, see Charles Ragin’s What is Qualitative Comparative Analysis (QCA)?, slides 6 to 15 on The bare-bones basics of crisp-set QCA. In his presentation Ragin provides data on 65 countries and their reactions to austerity measures imposed by the IMF. This has been condensed into a Truth Table (shown below), which shows all possible configurations of four different conditions that were thought to affect countries’ responses: the presence or absence of severe austerity, prior mobilisation, corrupt government, rapid price rises. Next to each configuration is data on the outcome associated with that configuration – the numbers of countries experiencing mass protest or not. There are 16 configurations in all, one per row. The rightmost column describes the consistency of each configuration: whether all cases with that configuration have one type of outcome, or a mixed outcome (i.e. some protests and some no protests). Notice that there are also some configurations with no known cases. Ragin’s next step is to improve the consistency of the configurations with mixed consistency. This is done either by rejecting cases within an inconsistent configuration because they are outliers (with exceptional circumstances unlikely to be repeated elsewhere) or by introducing an additional condition (column) which distinguishes between those configurations which did lead to protest and those which did not. In this example, a new condition was introduced that removed the inconsistency, which was described as “not having a repressive regime”. The next step involves reducing the number of configurations needed to explain all the outcomes, known as minimisation. Because this is a time consuming process, this is done by an automated algorithm (aka a computer program) This algorithm takes two configurations at a time and examines if they have the same outcome. If so, and if their configurations are only different in respect to one condition this is deemed to not be an important casual factor and the two configurations are collapsed into one. This process of comparisons is continued, looking all configurations, including newly collapsed ones, until no further reductions are possible. The expression indicates that IMF protest erupts when severe austerity (SA) is combined with either (1) rapid price increases (PR) or (2) the combination of prior mobilization (PM), government corruption (GC), and non-repressive regime (NR). Compasss: A website which provides a range of resources on QCA including: an extensive bibliography of journal articles; reviews of software applications that can be used for QCA; listings of events and training relevant to QCA; and a range of other resources focused on QCA. A Critical Review of Applications in QCA and Fuzzy-Set Analysis: This paper from Patrick A. Mello focuses on reviewing current applications for use in Qualitative Comparative Analysis (QCA) in order to take stock of what is available and highlight best practice in this area.